DO YOU REMEMBER CECIL PRITCHARD? 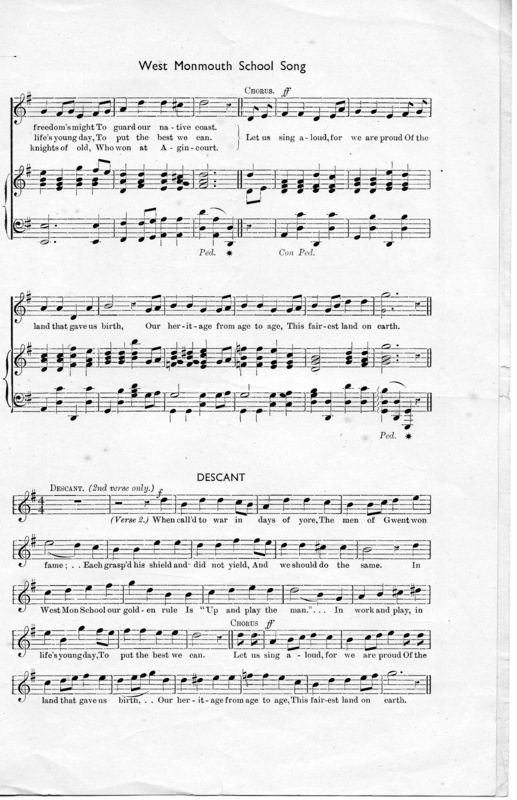 The following is a page from an old programme for one of Pontypool’s rugby matches. 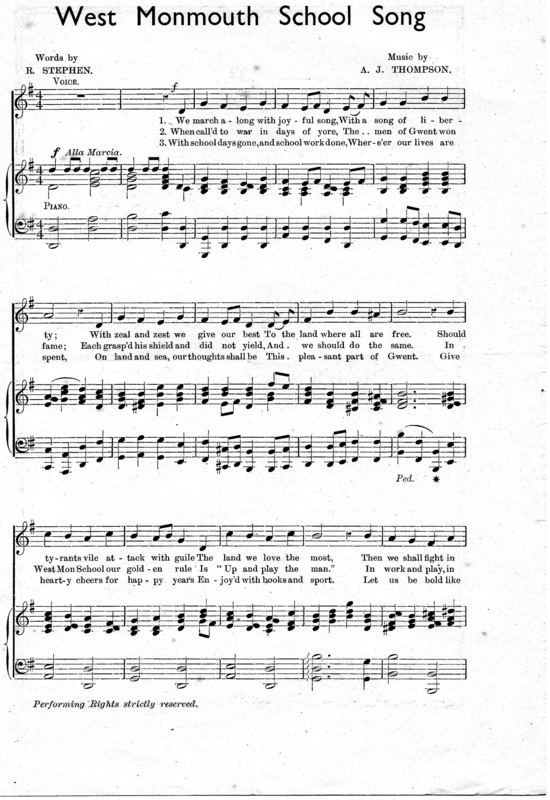 Unfortunately it was not dated but I think it must have been written in the early thirties or soon afterwards. It is written by someone named Retlas which, I assume, is a pseudonym for the person who wrote a weekly page in the programmes. I cannot trace who this person was so if anyone knows I’d be delighted to hear from them. I tried to make enquiries on the Pontypool Rugby website but I could not leave a message without registering; when I tried to do this the registration was not working. Cecil was the step-brother of Edgar Smith, the father of my friend Eric Smith, my one-time next door neighbour. Royce Pritchard was Cecil’s son and one of our playmates; he features in one of the Boys’ Brigade photographs earlier in this blog. Eric told me on one occasion that he was the only player that had played for Wales in every position on the field. There are various records claimed for him in the piece below, but, of course, over the years these might have been equalled or passed. Cecil for Pontypool, and Royce for Cross Keys and Abertillery. phase of the forward game, besides being quite capable of giving . a good account of himself at centre or full-back in an emergency. 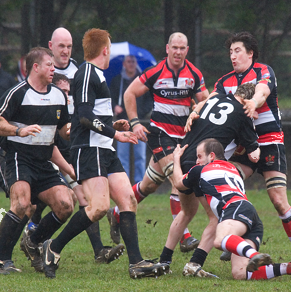 played five times for Monmouthshire. 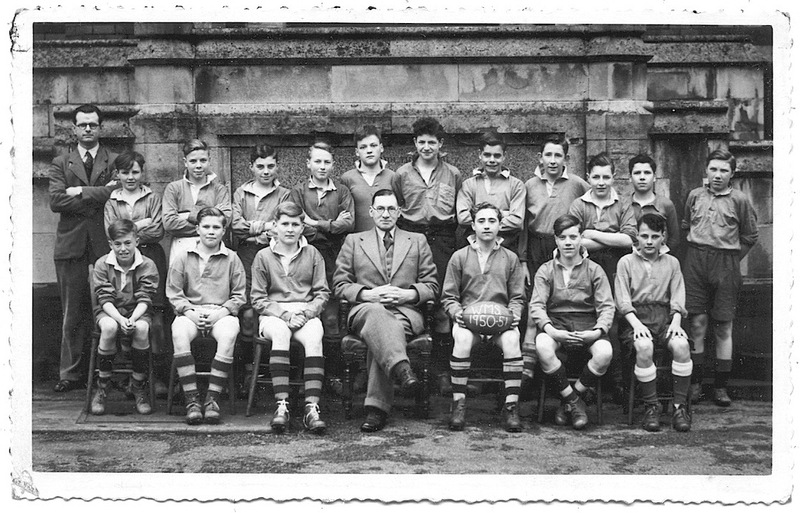 I recently received an email from Emrys Lewis, an old Westmonian who played for the school colts rugby team. 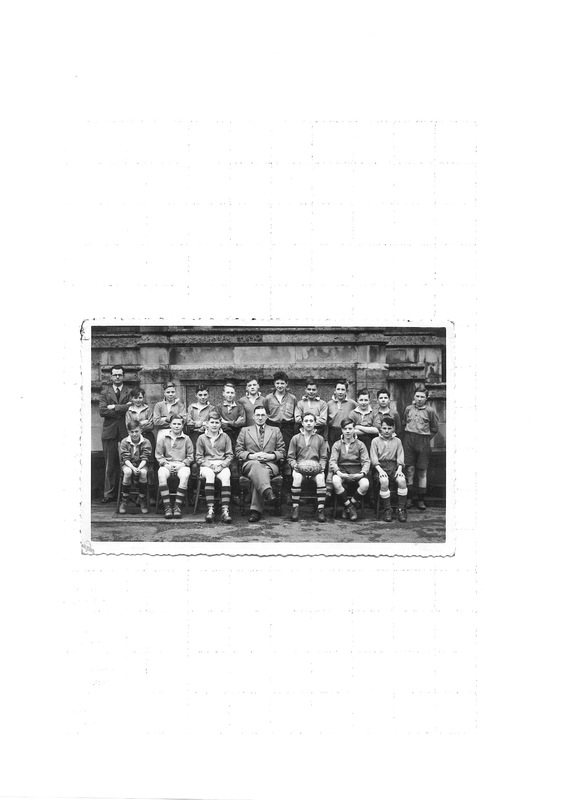 He enclosed a photograph of the team which he thought some old visitors might like to see. I’m sure the photograph will stir up some memories for some people. Emrys is the boy holding the ball. FOR PONTYPOOL RFC IN THE 1960s? “My father is Paul Jones, a player of Pontypool RFC in the 60’s. But his father’s family are from Llanelli and I wanted some help from him looking there. Anyway, meanwhile I began looking at my mothers side. 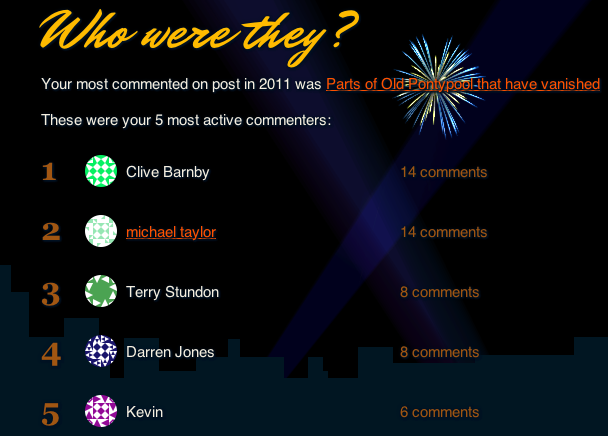 I have done quite well using the usual websites and have some names and dates to build upon. I am looking forward to building upon these names and dates. 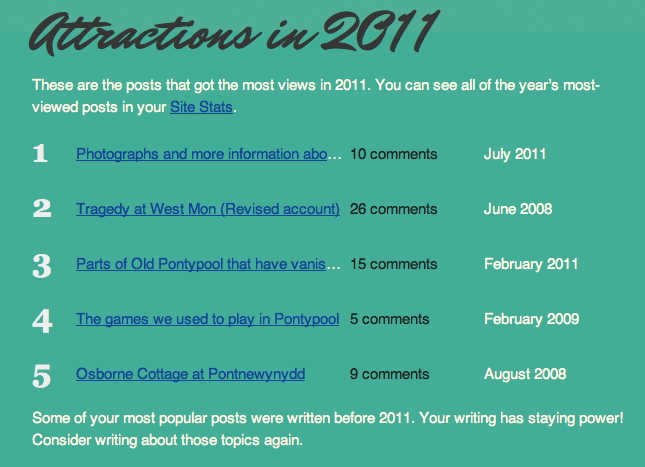 I have a rich Pontypool heritage it seems. If you are able to help Lucy in her search please either leave a comment on this page or email me and I shall forward your information to her. 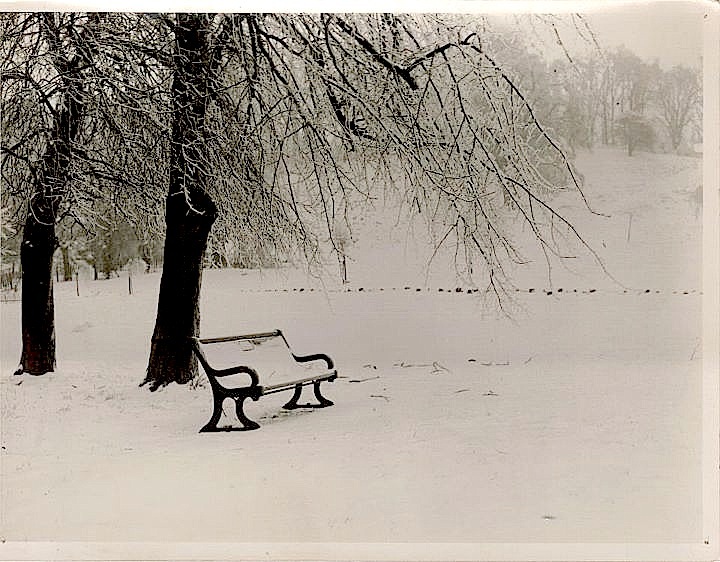 On August 19 2008 I wrote a blog post about Pontypool’s big freeze < Pontypool’s big freeze of 1941 > On February 5 2009 I wrote about Pontypool’s great snow of 1947 < Pontypool’s great snow of 1947 > You might have read these. I have recently received an email from Michael Taylor with some photographs of these events. I assume that the first photograph is of 1941. Certainly this is typical of what could be seen all over Pontypool and the surrounding areas. 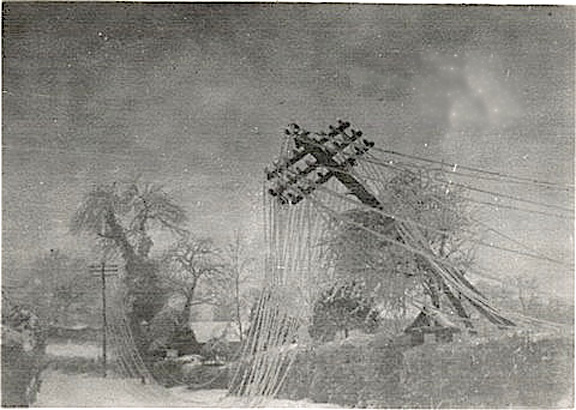 You can clearly see how the weight of ice has brought down the cables and has even pulled over the massive post. 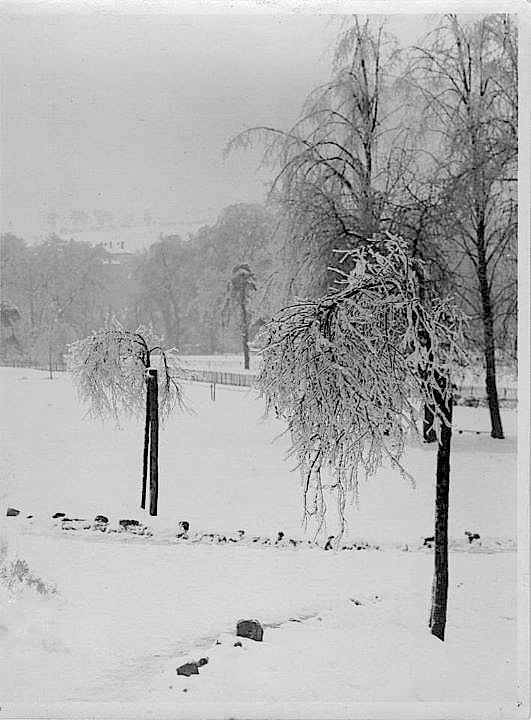 The other four photographs below are of the snow in Pontypool Park in 1947. 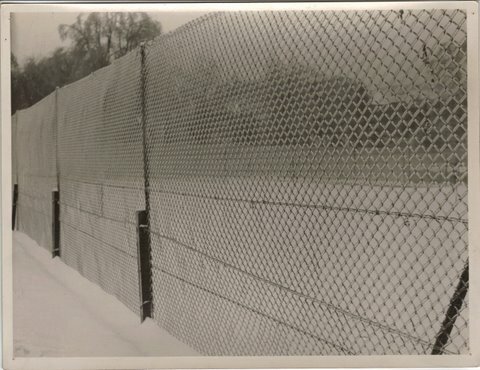 I imagine these were taken after the first fall because they do not show how deep the snow was, in some places well over a foot with drifts considerably deeper. My grateful thanks to Michael for providing these photographs. In the 1930s school funding was nothing like as generous as it is today. When I became the head of a junior school in 1984 I inherited a stockroom which was as large as a classroom and filled with hundreds of feet of shelving stacked high with all manner of exercise books, text books, pens, pencils, rulers, craft materials, art materials and a host of other things; we wanted for nothing. But in Town School in the 1930s the entire stock of school books, rulers and pencils etc. 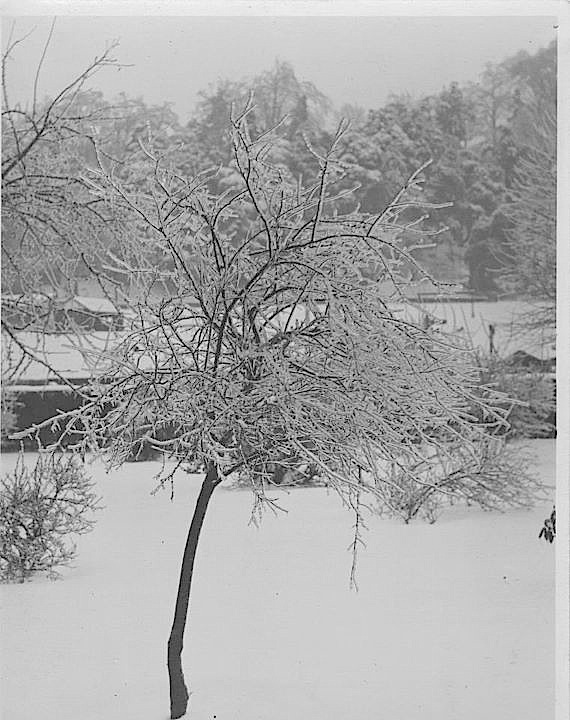 was contained in two small, glass-fronted cupboards in the office of J.P. Lewis, the headmaster. The room was not large but also contained the headmaster’s desk and the inevitable tortoise stove. I remember the two occasions when all the children who were about to enter the Eleven-Plus exam at West Mon and the Girls’ County School were summoned to Mr Lewis’s study. We were each given two brand new, sharpened pencils, a pencil sharpener, a rubber and a ruler. We were told that, if we were to break the point of one pencil, not to waste time sharpening it but to use the other one. It is because of these two visits that I know where the stock was kept. Needless to say, these items all had to be handed back the following day for future use in the school. The funding of the school was based on the average attendance figures which is why, as I explained in an earlier post, the headmaster used to get so very annoyed when whole families went hop-picking in September, the beginning of the school year. Consequently the staff would organise from time to time some sort of effort to raise money for the school. It was during the 1930s that the BBC started broadcasting for schools; these were received on the wireless of course. There was just one snag: schools were not supplied with wireless sets to receive the programmes. As a result they had to buy their own. As a result, the staff at Town School involved both themselves and as many parents who wanted to help, in the manufacture of oven-pads. These were knitted squares of any colour which would form some sort of insulation when handling hot items from the oven. Each oven-pad was sold for 4d. After a month or so enough money had been raised to buy the much-needed second-hand wireless set. I recall the grand occasion when two classes were assembled in Miss Brooke’s room to hear our first BBC broadcast. It was a music programme about Mendelssohn’s Hebrides Overture, also known as Fingal’s Cave. It takes about ten minutes to perform, but the broadcaster introduced it to us in small sections and explained what the composer was trying to do before we heard the whole piece right through. I really did enjoy it right through to the end when the seagull’s call is played on the flute. The second broadcast we assembled for was on English literature: Shakespeare’s Julia Caesar, no less. The broadcaster told us that he had chosen just one speech from the play, the funeral oration by Mark Anthony which you’ll probably remember from your own school days. It begins: “Friends, Romans, countrymen, lend me your ears . . .” We were told what a clever speech it was and that after saying what an honourable man Brutus was, Mark Anthony repeated this with ever-increasing sarcasm so that the listening crowd realised that he didn’t mean that Brutus was honourable in any way and they rushed off with the intent of burning down his house. I was most impressed with this speech and thought what a clever chap this Shakespeare was. Later on, in form four, we read his “Merchant of Venice”. That was great too. A short while later the school was given a second-hand tricycle by a doctor whose son had finished using it. It was in excellent condition and, wonder of wonders, it had a chain to drive it just like a proper bicycle. Most tricycles in those days had a fixed wheel so that when you stopped pedalling you stopped moving. Hence they had no brake. With a chain you could free wheel so a brake was needed in order to stop. We were informed that the school was going to raise funds by raffling the bicycle. Naturally, we all wanted the tricycle so we rushed home to ask for money to buy tickets the next day. The selling went on for a couple of weeks and then, on the great day the whole school was assembled in the playground for drawing the number of the winner. The ticket was drawn and the winner was – Miss Lewis, sister of the headmaster. We all laughed at this as a more unlikely person to want a tricycle could hardly be imagined. Miss Lewis was my class teacher. She was short and dumpy and had no children to give a tricycle to, so, after the laughter had died down she asked that all the children who were in her class and had bought tickets should have their names put in the hat and the draw should take place again. Only twelve of us in her class had bought tickets. Our names were put in the hat and the name drawn out was mine! I could hardly believe my good fortune. I was the owner of a tricycle with a chain! The cost of these now is over £300. The tricycle had been kept locked away in the caretaker’s cellar. The door to this led off the playground and when we were playing in the yard we sometimes peered down the steps into the cellar’s murky depths to see the caretaker bustling about amongst the piles of coal, coke and wood. Mr Lewis announced that I was the winner and that I could now have a practice on the tricycle on my own in the playground while the rest of the school went back indoors. My family were delighted with my win and all my friends wanted to see – and have a ride on – my new tricycle. I spent many hours using it for the next two years or so until I eventually bought my first “proper” bike, a second-hand fairy cycle for which I paid the princely sum of 2/6. In my blog-post about the Peake’s coach tragedy, I mentioned Monty Dart who is currently writing a book “Who Killed Dripping Lewis?” I wrote briefly about this murder on 25th August 2008 in my blog-post entitle “Murder Most Foul in Pontypool”. Monty has really gone into this matter and has researched all manner of documents including the Scotland Yard files. She also has the list of all those who gave evidence; strangely enough one of them was my old Boys’ Brigade captain, Jim Hamer. I mentioned him in a previous post. From time to time I have briefly mentioned the fact that I receive emails and phone calls from various parts of the world, so I have suspected for some time that it must be from people who have moved from Pontypool to some other country. 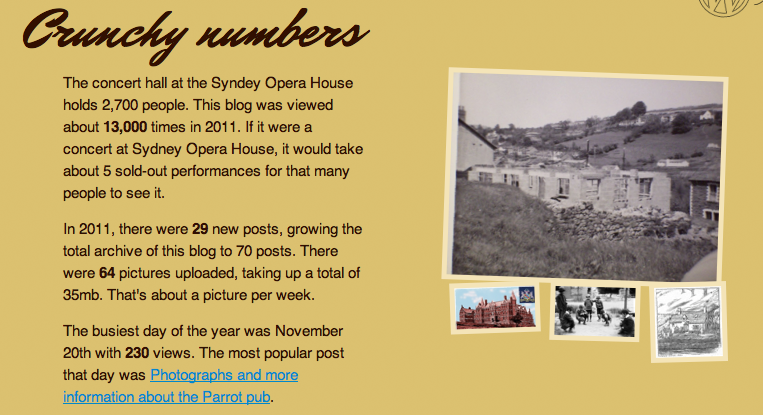 However, for the first time the good people at WordPress – the organisation which offers the facilities to run blogs – have sent me a report on my blog for the year 2011. 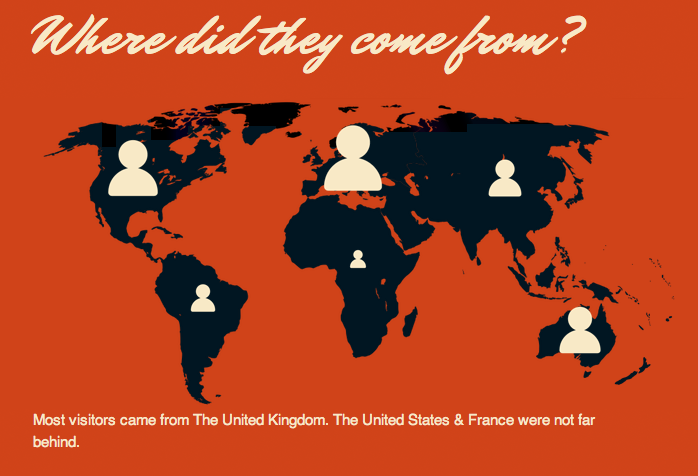 I found it absolutely fascinating, particularly finding that people from no less than 24 countries have visited this blog during the past year. I thought that visitors might be interested in the assortment of information which has been provided in this report, particularly as some of you are named in it. Now you know what I mean when I say that Pontypool people are world travellers. I feel quite a small fry by comparison. Apart from two years living in Africa I merely moved to Cardiff and Newport. Well, there you have it. That’s the complete report. 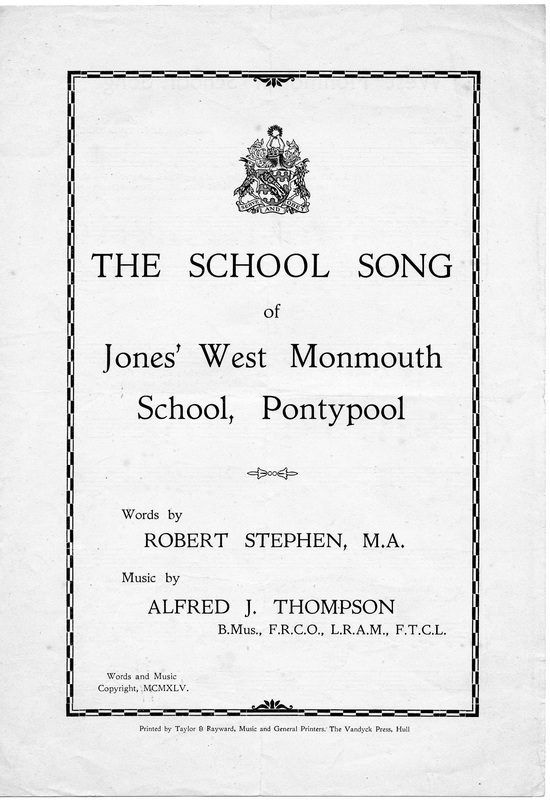 If any of the visitors from the far-flung parts of the globe would like to write in with some of their Pontypool memories, I’d like to hear from them.